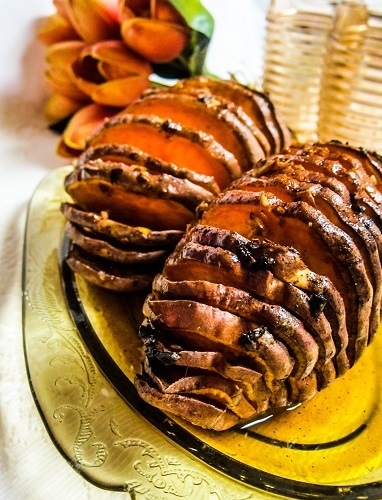 If you are looking for a fancy side dish for your Easter meal, these Hasselback Sweet Potatoes are a good option! Most people make these with regular potatoes, but I prefer the sweet potatoes because they pack so many nutrients and vitamins plus plenty of fiber. These are actually fairly simple to make, despite their appearance and they happen to be gluten free, dairy free and vegan. So they are suitable for people with those dietary restrictions. You could even prep them a day ahead of time cover them in the fridge and bake them off the next day! Whisk together the oil, maple syrup, garlic, sea salt, pepper and chipotle in a small bowl and set aside. Take one of the sweet potatoes, cut the ends off, then lay 2 wooden spoons on either side of it, and cut 1/4 inch thick slices into it just until you hit the knife (you want the bottom portion to stay attached). Repeat with the remaining potatoes. Place the sweet potatoes on the prepared pan, and evenly drizzle them with the oil mixture. Sprinkle with a little more sea salt. Cover with foil and bake for about 30 minutes then uncover and bake for about 30 more minutes until they are tender and lightly brown. Remove from the oven, let cool about 10 minutes and enjoy!